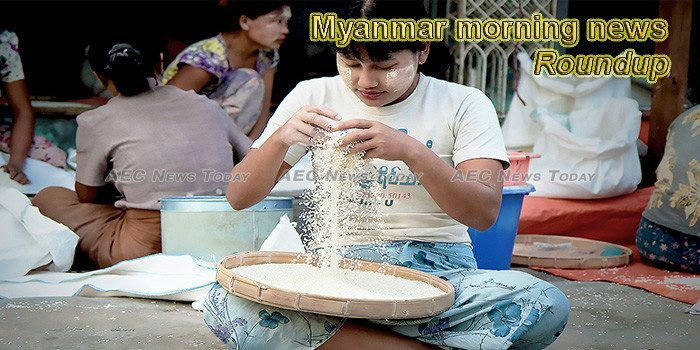 From April to, 2018 to January 18, 2019, Myanmar earned 642.763 million from exports of over 1.92 million tons of rice and broken rice, according to the Trade Department. State Counsellor Aung San Suu Kyi said that they would implement an environment to bring investment to the country through reform works. Sagaing Region government is signed MoUs to produce electricity from biomass and sugar in the region during Invest Myanmar Summit 2019 held at Nay Pyi Taw, sources said. The chairman of Myanmar’s investment commission on Tuesday suggested alternatives such as downsizing or relocating a stalled Chinese-backed dam project that has strained ties between the two countries, Reuters has reported. More than 270 candidates including political party members have submitted their applications to run for the Yangon City Development Committee’s election, said Aung Khaing, chair of Yangon City Development Committee Election on January 29. MYANMAR has been pursuing its “Capital Markets Development Roadmap” since 2008 to set up a bond market. The country is on the correct path, but now it needs traffic in the form of corporate bond issuers and both foreign and domestic investors. Myanmar’s government is working to find a solution on how to proceed with the controversial Chinese-backed Myitsone Dam project in Kachin state, suspended in 2011 amid heavy public opposition to its environmental and social impact, according to a government minister. Myanmar’s largest business lobby group suggested that the government should focus on improving policy implementation and that further liberalisation is necessary for attracting investments. CMP (Cut-Make-Pack) businesses have imported raw materials worth over US$600 million over the past three months in the current 2018-2019 fiscal year, exceeding nearly US$100 million compared to the same period of last FY, according to the Ministry of Commerce. Myanmar’s parliament has approved a proposal for the establishment of a committee to draw up amendments to the country’s constitution, which currently gives strong political power to the military. The National League for Democracy (NLD) faced a heated response from Tatmadaw (military) legislators as it made its first bid to amend the military-drafted 2008 Constitution in parliament. With its turquoise blue waters and stunning sunsets, Ngapali, Myanmar’s most popular beach, is thriving as a holiday spot. It’s countryside vibe, well-preserved culture and local attractions cater to all manner of travellers from wedding parties and business guests to FITS and backpackers. DESPITE THE reluctance of many foreign companies to invest large amount of money in Myanmar in fear of policy uncertainty, Index Creative Village Plc is expanding its business in the country, according to Kreingkrai Mek Kanjanapokin, founder and Group CEO of the company. Telenor Myanmar posted an operating loss of NOK 43 million for the fourth quarter of 2018, compared to an operating profit of NOK 347 million in the year-ago period. The operator’s total revenues for the quarter amounted to NOK 1.25 billion, down from NOK 1.59 billion in the same period the previous year. EDOTCO Myanmar Limited, an integrated telecommunications infrastructure services company, reinforces its commitment to championing sustainable telecommunications infrastructure as it kicked off two projects focused on using renewable energy to increase operational and energy efficiencies as well as reduce operating expenditures while staying environmentally friendly. Police and soldiers in Chumphon on Tuesday night arrested 37 people from Myanmar who were waiting to be taken onward to Malaysia. Artists from Myanmar perform at the Gala Show of Paukphaw Carnival for Happy Chinese New Year 2019 in Yangon, Myanmar, on Jan. 30, 2019. Myanmar’s first-ever Ethnic Culture Festival, which ended yesterday, saw 135 different ethnic groups gather to showcase their traditions and culture. The Invest Myanmar Summit 2019 is off to a roaring start in Nay Pyi Taw, offering local and foreign investors opportunities for business and investment through a single window and one-stop facility, and a platform to interact with each other, obtain information, and exchange ideas one-on-one with the business elite. Negotiations are underway to change the size, scale or location of the Myitsone dam project in Kachin State, U Thaung Tun, Minister of Investment and Foreign Economic Relations, told the media at the Myanmar Investment Summit in Nay Pyi Taw. If a peace process is to lead to a peace supported by the entire country, everyone needs to be involved in making it. But often groups, such as people living with disabilities are excluded from this vital national conversation. iSchool-Myanmar is working to change this: with the support of the Joint Peace Fund, it is running a project on peace education for marginalized groups of people in Central Myanmar. Mitsubishi Fuso Truck and Bus Corporation, a subsidiary of German automotive giant Daimler AG, is set to expand its footprint in Myanmar with the opening a major showroom in Yangon that is expected to be open by the end of this year.